Coach keep away skills with this soccer 2 sides keep away drill that focuses on improving possession within your team. Teamwork is required to have success in order to keep the ball from the defenders. 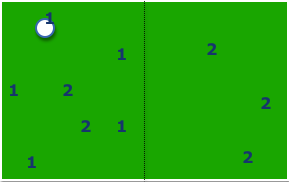 - Set up this keep away soccer drill with 2 teams of 5, 1 team in each grid. - Set up 2 grids 20 x 25 yards. - All balls should be with you, centrally just off to the side. - You pass a ball into one side, and 2 defenders from the other team sprint in to defend. - Attacking team must make 5 passes and then pass the ball to the other team to gain a point, the play continues and roles reverse. - If defenders win the ball prior to the 5 passes, they can turn and pass it back into their side, reversing the roles and becoming the attacking team. - If ball goes out of play, the play begins again with a ball passed into whoever the defending team was. - There should be constant movement from the players. - Passes should be accurate, and along the ground at all times. - Players should be in constant communication with each other. - 3 players not involved on defending team should still be moving within their grid. - Passing and moving should be the focus. - Increase passes necessary to get a point. - Add a 3rd defender. - Add a goalie in the middle and set up 2 posts with flags, to gain the point players must "score" through the posts after the 5 passes. - 10-15 minutes for this soccer 2-sides keep away drill.